I would like to take this time to Wish one and all a Happy New Year and may we have a n awesome 2009 season ahead of us. This Sat we will be playing an internal game of 10's for 4 quaters. This game is meant for Afiq send off. Pls be at the field by 3.30pm (West Coast Park)and we will settle the team. See you all on Sat. Time: 4pm onwards till 11pm. Please contact me if you need more information. It will be a pot luck style so all players will have to bring some food and drinks. Theme will be BEACH WEAR!!!!!! There will be also a short meeting where all players will choose each team(Men and Gals)committee. That is team Capt and Vice Capt, President, Secretary, Logistics Manager and Treasurer. So please have your choices written down a a paper and submit to me on the 30th Dec. We will have a voting on that day. Please RSVP your attendance via on the comments col on this blog. 1) Tue training 23rd Dec 2008 will be the last training sessions for year 2008. So I would like to request for players to come down and a fun training. 2) 27th Dec game is cancel. Please take note. 4) AGM will be held in Jan 2009. Date will be inform and all playing member need to be present for the meeting. Team Secretary (Amirah and Wan Ping) please take note. 5) Send off game will be on 3rd Jan 2009. This game is meant for Afiq whom is going to NS on 6th Jan 2009. I will inform of the venue in due time. Both boys and gals section. It was a hot and sunny day at OFS (Paterson Road). A total of 24 players turn up for the game against OFS. OFS kick off, it took them less then 10 mins to scroe two tries against us, bringing it to 12-0. Lack of communication and tackling led to this. After the second try from OFS the boys decided that's it time to come back. Try by Farhan(bear) under the post, convert by Bryan. Second try came from Dustin running passed the forward from OFS and was converted by Remy. Third try came from Syaffiq(a.k.a Rapper)a kick and chase from our own half led to a try, which was converted by himself. Second half saw the team abit more hungry, with the opening try from Dustin and convert by Bryan. A final try came from Mark Ngo and converted by Hisham. Overall good game from the boys. 1) We would like to wish all our players that are collecting their "N" Level result tmw good luck. 2) Game with OFS 18th Dec 2008 at 5pm(Kick Off). Veune: OFS, 25F Paterson Road. Those that are meeting me, 3.30pm sharp at Orchard MRT. All players are to wear the red club t-shirt tmw. 3)Training this Sat as usual: West Coast Park 4pm. Both section Men and ladies. 4) Those who are free come down and support your team this Thurs at OFS. 5) We would like to wish Coach Sean a safe and happy trip with his family members. As he will be leaving this Fri for a 2 weeks hoildays. We would like to wish you a Merry Christmas in advance. More pictures have been uploaded. So please check out the weblink provided. This thurs we have a game with OFS. All players that wishes to play this thur are to come down for training tmw at CCAB. So that we could do some team run. I will provide more details during training tmw. Club training resume tmw at CCAB 7pm sharp. See you all there tmw evening. That's what we have to say about our rugby tour. Great job boys..a job well done!!! Game 1 (Day 1) was with Sultan Ismail School from JB, the game started with both side not knowing each other strenghts or weakness, however, we came up on top of them in the first 10mins as we were camping in their halves most of the time. A break thru by forwards allowing bryan to score the first try of the tour. Mins later another bryan was the try scorer again. Just before the half time, aidil run rampage pass the Malaysians backline to the 22 before he was taken to ground but great support from Afiq and he run in with a try. Second half was like a new game to us with the changing the whole team (Combined school). Again we started with great impact but this time round the team is stronger and harder. We held up our grounds and manage to hold the team up till the final whistle was blown. With them scoring one try and one converted try. Game 2 (Day 2), we knew that our opposition will be strong as we are playing with Johor State Team (Warriors). Our aim is to play our game plan that was taught during training sessions. In the whole of the first half both team did not allow any mistake hence leaving the half to 0-0. Indeed this team is very good. They are hard hitters and fast runners. Second half we came in stronger and wanting to take the game to our hand. We a lack of concentration and a miss-pass it allow the Johor state team to intercept the pass and score a try. Just unlucky that is what I have to say. But the team did not give up after a try down with 10mins to play. From the restart we keep attacking them and keeping the team in their own half. A break came thru when Bryan pick up the ball and committed a player and off load to Dustin(Capt) and he then see Aidil coming in from fullback and hence a short pass was make leading to a try under the post. With Bryan converting the try. With only 4 mins to go the boys keep pushing up but the final whistle was blown. Please be inform that there will be NO TRAINING this Sat as the team will be heading to JB for a rugby tour and games. Training will resume next Tue. 2) All players are to wear club red t-shirt that was given. THose who have not got it yet I will provide to you on Fri morning. Botton you could wear your jeans or shorts. 3) Upon arrival at the Hotel, room ic will be given the keys. There will be training tmw at CCAB. Time as usual 7pm sharp. For those that have not paid up for the tour this coming Fri this is your last chance in doing us. After tmw we will not be accepting anymore payment for the tour. PS: All new member to the club please pay your subs...Thank you. It was a great turn-out for training. For those that have not hand up the consent form for the trip this tue will be the last day to do so and PAYMENT must be made on Tue. Just a reminder that there will be training tmw for both gals and guys. We will have some fitness training, followed by drills and touch rugby games. Tmw training will a mixture of fun and drills. There will be new player joining us tmw, I just want all players to welcome them with open arms. And also those have the consent form for the trip you NEED to bring it down by Sat and also with the full PAYMENT. As we the club need to buy insurance for players. Please be reminded of club training tmw. Tmw I will be handling out the consent form for the upcoming rugby tour. So please come down and get the form. All system all for the tour. Bus and hotel have been booked, insurance for players and meals. It will be a fun trip and great games with the Malaysian Teams. 1) The under 18s did very well for the Norton Rose International 10's. We came in Plate Runner up, losing to SAJC 7-5. Great job boys!!!!!!! 2) Tue club training will resume as normal. 7pm sharp @ CCAB. 3) Consent form will be given out on Tue for the upcoming Rugby Tour. All froms must be filled in and return on Sat with the payment. 4) Welcome back Daryl. We are glad to have you back with the club. 5) Ladies training is as usual, tue and sat. Please contact Ferisha or Huiqi if you need further details. Ta'Moko Lions RFC Rugby Tour! Its the time of the year. And this year being our first year together as one club. We have come up with a year end rugby tour, and this will be an annually affairs. The club will be touring JB this year for a start. Game have been arranged for us by Mr. Ibrahim. There will be a total of three games of 15-a-side during this tour. Cost: $100-$120 depending on the amount of players travelling. I will be handing out the consent forms by tmw. All payment have to be make in cash. Please report to Singapore Polo Club tmw at 1pm sharp. Please take note of a change in the line up. Masli will be replacing Naz. The rest will remain the same. See all of you on Sat. Both players and supporters. Players are to report to Polo Club by 1300hrs sharp. Supporters come down and support your team-mates at Polo Club. This is to inform all of you that Coach Bart will be away from today till Jan 2009. He is back in NZL to attend to his family matters. At the mean time. training will still be as usual. Please be inform that there will be training tonight. We will also select the 14 players that will be playing on this weekend tournament. Now we have to draw our attention to 10's. Tue training will be on 10's and all players please be present. We will do the selection this Tue, 14 players will represent the club this coming Sat 29th Nov. The boys team had their first 15's a side game after so long. Playing SCC at The Padang on Sunday morning. In the first 10mins of the game the boys did very well and we were camping in their half. From a line out the forwards drive on and Kelvin Choo scored the first try. With Bryan added 2 points. Into the last 10mins of the half three tries was scored. One for SCC and two for Lions. Ball was send out from the blind to Md. NOh and he score a try at the corner of the field. With a restart to come, Bryan kick it long and we had players chasing the ball, Md. Noh and Dustin had the bounce and scored the second try for Lions. Second half started with a slower pace with both teams feeling the heat of the sun. A lack of concentration and giving away a penalty within our 22m allow SCC to score their second try. Last 15 mins to the second half the boys came back strong, with Syaffiq picking up the ball off a ruck and running under the post. Converting his own try. Boys held back SCC to the final last min an a penalty was awarded to us, Syaffiq took the kick and adding three points to Lions. Please be inform that we will be playing SCC this coming Sunday. All players are to report to SCC by 8am for warm up and taping. Its kinda of disheartening for me and the rest of the coaches. However the game this sat is postpone till 1st week of dec for the boys. THe gals will still be playing in the morning. THeir first game is at 8.00am. This sat trg will resume as we coaches need to select 15 players for the upcoming Norton Rose International 10s tournament on the 29th Nov at Singapore Polo Club. So please come down if you want to be selected for the tournament. PS: Come down and support our ladies for their first ever touch rugby game. Tmw there will be club trg. Both gals and guys. For the gals tmw will be team and game play. So pls come down. Please be inform taht this Sat there will be training and some game play to be done. Please be at the field on time so that all can go back on time too. This training is meant for both guys and gals. Please be inform that there will be training this sat. Attendance is needed for those wanting to play in any games and also for the Norton Rose International 10's this coming month end at Singapore Polo Club. I will only select 15 players. See you all this Sat. THis Sat there will also for training as we are having a tournamnet at JJC on the 22nd Nov.
We will be doing some endurance run along the stadium if not will be outside. Bring along your running shoes. Please be inform that this sat there will be club training. Please be early and change up. There will be a game schedule in 3 weeks time. Please be advise that club training will resume for both guys and gals team this coming week. And we would like to wish all our hindu player a happy deepavali! The pictures for the above mentioned have been uploaded. THanks to Ian for sending me the pictures. Please check and paste the above link and paste it. To commemorate their opening they will be giving away a CCC Coffee Mug for net purchases above $100.00 during our opening launch. VIP members will additionally be entitled to a free CCC Sponge Ball for such purchases whilst stocks last. This promotion will run from 21st Oct to 9th November 2008. Please be inform that this week there will be no training. Both Tue and Sat. We will be taking a short break for a week, the following week training will resume. Have a good week break. Great Job at the above mentioned by all players that turn up for the race. A day of fun, heat and wet weather. The team had fun and most of all all players have a chance to mingle around with other players from the club. I would like to say congrats to the top three team. Boys great work and well done. Please do not be LATE as I want to start it on time at 1pm. Anyone have pictures pretaining the clubs please email me so that I could upload it. This Sat there will be no training as the above mentioned will take place. Teams will be group up on that day. Each team will consist of 4 members/players. Once the team is allocated there will be no changes of team members. Rules will be provided on the actual day. It will be a whole day event at Sentosa. We will not be going to O'Learys after the event. Dinner will be at sentosa island. There are 10 stations in total for this weekkend race. I would advise all players to bring along a change of clothes and shower stuff. Also bring along your swimming gear as some part of the race required you to swim. PS: All bags will be kept in the coaches car for save keeping. Please be infrom that there will be training on Sat as usual. See all of you tmw. To all ladies members, this Saturday Barclays Cup Competition has been cancelled due to some reasons. This Sun 12th Oct Aidil welcome all of you to go over to his place for Hari Raya. Dear Members of the club. So all club members(Men or Females) you are request to come down for the event. It will be a time for team bonding and gathering as a whole. All players are to sign up for the event by posting your name on the comments col. This will help the committee to pair up all players. All players must be present both male and female. Gals team please be at training so that we could go thru the game plan for Sat Barclay's Cup. Tue game was an awesome played and shown the true colour of Tamoko Lions RFC spirit, "Never Say Die". It was a second defeat at the hands of UWC but this time round UWC had a very hard time bringing on what they had to us. Great work by all players on that day. Good defense, good covering, great attacking chance we had. ESP: good defense off every ruck and maul. What we ready need to look at now is teamwork and having more games so that the team will be playing a whole complete unit. I will say that it was a great effort from all our players. Try score by Waichong and the last game try from Dustin. Bryan did a great job as scrum half this game compare to the last. Please report to UWC by 345pm. There wil be no training tmw after the game. Please be inform that training on sat is ON. This sat the training will be base on the upcoming game. Loads of team run and breakdown skills. In due to the upcoming holidays festival. Today training is cancel. Please take NOTE. Training on Sat however is still on as the game is on for tue 30th Sept and all players that want to play have to come down for club training. Game on Tue is off.We will have the return game on the 30th Sept with UWC. There maybe French School too. Those that want to play you have to come down for training. See all of you there. Game will kick off at 545pm. We will have our team dinner outside the school as we have to leave the school by 630pm. Game for tue with UWC have been change to Thurs. Reporting time: All players are to report to the field by 420pm. See you all for training tomorrow. I would like to welcome three new players to the team. Club training today was awesome. Great attendance and great training by all. Keep up the good work. BTW: All blacks won the tri-nation 28-24 beating Aust. Training will start at 230pm sharp. After training we will be heading down to O'Learys to catch the game between All Blacks and Aust. 1) We would like to take this time to welcome two new players to the club: Daryl and Alan. Welcome both of you. 2) I would like to official announce that Sean will be the new backline coach together with Nagami San. 4) This Sat will be the last tri nation. The game will be shown live at O'Leary's, so all players are encourage to go down and watch the game. 5) Club training on Sat will be brought forward due to the Tri Nation. We will be training from 2.30-5.00pm this Sat. See all of you tomorrow. We will be provided with a 30mins time slot to run learn to play rugby program at East Coast Park in conjunction with Lets Get Physical Family Day. Please drop your name down at the comment section of this post. Ladeis and guys al welcome to help out. For those that want to play in all the friendlies, you MUST turn up for training. Fielding of player is base on your attendance at club trainings. Those that have camp and have already informed me will be excuse from training. If you cant make it for any training please inform the coaches in advance. Team Run: Restart, kick off and phase play. See all of you on Sat. All players are urge to come down for training and also for sat training(unit run). Players will be field based on the attendance of club training. We will be having more games lined up. We will try to arrange games with clubs in Singapore. It will be an exciting year for the youth team, as there are many tournament coming up till end of the year. Please be reminded to bring along 1 litre of water. Let's Get Physical first Family Fun Festival at East Coast Park!!!!! They would like to request for Volunteer to help out in the day event. All volunteer are greatly appreciated. It will be a great day of fun and laughter as a team. The coaches will be there to help out as well. Please leave down your name on the feedback area and I will keep you all posted. **Please bring along at least one litre of water with you. Calling all players born in 1990 and above. We have a club rugby tour coming up in Oct to Hong Kong for the above mentioned tournament. This is a major rugby tournament in Hong Kong. I will be selecting 15 players for the trip this time round. Selection will start next Tue onwards, and I will be arranging games for the team as the selection process goes along. Do watch out the space for more information. I will be posting up the training calender season 2008/2009 for the men's section by end of this week. Please keep a look out for the post. See you all on Sat. Attendance is a MUST. For both ladies and Guys. Bring along your trainer in case it rain we could do track work. This Sat training (23rd Aug 2008) will be as usual for both men and ladies. As exam is over for most of the players training is critial for those who want to play. We will be having team run from this week onwards. Please remind all your players to be down for training if they want to play in any games. Please be inform that there will be training tomorrow at CCAB. Those 7s player please along your jeresy and return them. After training we will head down to our sponsor pub O'Leary's to catch the live game of NZ vs SA. PS: All JB 7s players are to bring down their Jersey and return on Sat and then to O'Learys. Will see all of you at training and O'Lerays. Please bring along running shoes and boots. Fot those who went for the JB 7's please bring along your jeresy and return. Myself and the coaches are very proud of the team that played in the above mentioned tournament. Very Very PROUD!!!!! Staring out the day of tournament not knowing who we are playing with. Group with Ungku Husin, Teknik Segamat and MSAB Potain. Game 1(0918hrs), was a abit tense, but we did good with Naqi the capt scoring a try from a penalty to draw the game, 5-5. Winning one game and drawing one game place us top of our group. Therefore we are qualify for the winner's pool. Again not knowing who our opposition is, we were all prepared for any team that came along. Game 1(0930hrs), playing 2nd of group E SMK Haji Ali Potain. Winning with a margin of 22-0, try coming from Bryan, Aidil * 2 and Waichong, conversion by Md. Noh. Winning our game means we make it to the cup quarter final, playing Syed Nasir A (JB District Champion). Game is played 7mins halves with 1 min break. Starting off the first half very strong holding back the Malaysian team, HF score 0-0. With the second half 1 min away the boys were all fired up. However we conceded a try 2mins into the second half and then one more try in the next 2 mins. Knowing that we have only 3 mins to go the boys pull back with a try by Bryan whom he converted, with only one min remain, the defense from the Malaysian team was strong thus holding us back. Final score 12-7 in favor to Syed Nasir A. Looking at the two day tournament in Malaysia the boys did very well and loads of credit given to the boys for their disciplines, attitude and the playing spirit of Ta'Moko Lions RFC. Being the only Singapore team making it to the Cup division, we are very proud. I am pleased to announce the new partner to the club. They will be our partner for all medical supplies that the club would required for our rugby season. Thank you Victor Sports for being our Club Partner. 1. There will be a a 7's training tomorrow at CCAB, Time 630pm sharp. All players are to pay for the bus transport. 2. There will be no club training this weekend. 3. Ladies touch training will now only be on Tue Night. 4. Supporters for JB 7's, for those who wants to support the JB 7's squad this weekend. The address is:Dataran Bandaraya JB(Playing Ground)-opposite Hyatt Regency Hotel(Jalan Sungai Chat). For those who want to stay over the hotel opposite where the player hostel is Seri Malaysia Hotel, they will be offering a special rate of RM$120 per night. I would like to congratule the following for making the cut to JB 7's to represent the club from 9-10th Aug at JB after so many rounds of selection. Concent forms will be issue out tomorrow and payment for the bus ride from Singapore-JB-Singapore have to be paid by tomorrow. Please be informed that there will be training tomorrow for both men and ladies section. Attrie: Boots, running shoes and training gear. This Sat game is cancel. And there will be no training for the ladies this weekend. This Sat training will be as usual. After training we will be having a game with the JB 7's squad. A final prep for them before they head to JB on 8th Aug. Please report to JJC at 9am, we will be having a friendly game of touch with JJC year 1. Training for tomorrow will be as usual. There is only one thing that players have to take note. Tomorrow we will be training the JB 7's players, so all JB 7's players are to come for training, attendance is compulsory. All other players please come down for training and at the same time help out the JB 7's squad. The gals will still be having training tomorrow but we will focus on game play. This Sat the gals section will be playing JJC year 1. THiru will be taking the gals training tomorrow. Training tomorrow at west coast park. Lets get physical will be taking us 4 a training session. As they are our sponsor n the feedback we got from the last session. Players enjoy it. So lets all head down tomorrow. After training, bus will pick player up n head dow n to O'learys to watch aust vs all blacks live! Please bring along $2 for the bus ride. We did not cater food, so it will be an open bar at 20% off your bll. Game this Sat have been cancel by nbss, as they do not have the field. Great news our sponsor O'leary have got rugby channel for the club. After training lets head down n watch aust vs nz. See you all at training. Yestersday was a great day and also a great evening for members that have turn up for the dinner and get together at our Sponsor Bar: O'Learys Sports and Grilled Bar. I will post the pictures that was taken last night. After which we will all head down to O'Learys Sports and Grilled Bar. The bus will leave West Caost Park to the venue at 5.15pm. So please get change fast after training and board the bus. Nagami and Thiru will be in charge of the bus. All system go for this coming Sat event at our new sponsor bar. Bus will be pick up players at West Coast Park-Carpark. Fees: Member are required to pay $10.00 on Sat itself. Looking forward to seeing everyone this Sat. Welcome our three new ladies into the womens touch team. JB 7's training is cancel in due of the Poly-Ite tournament starting this Thurs. Training will be held on Sat at West Coast Park instead for now. Club training this Sat will be at 3pm-445pm. Club gathering at our new sponsor O'Learys Sports Bar and Grill. Members are reminded to bring $10 each for the dinner. We will be collecting the cash on Sat. Ta'moko Lions RFC are delighted to have Summit Rugby Ball as our official rugby balls. Subs, thank you for those that have paid up their subs. For those that have not please do so this weekend. We would like to introduce our latest sponsor to the club. And a very big thank you to them. It will be our home bar from hence forth. All member will have extended happy hour price all day long. We will be heading down to the bar this coming Sat after training for some food, drinks and gathering. For those playing in the Youth in Touch please report to Turf City (ANZA Field) by 830am. The game will start at 9am. It will end around 2pm for round robin and then final will be played at 230pm. As there is only one group, top will play with second for the champions and 3rd and 4th will be play for third and fourth position. See everyone tomorrow at the game and training. There will be a training tomorrow at CCAB. Please bring along running shoes, boots and mouth-guard. Attendance, fitness level and skills are a vital part of the selection process for the team that is going up to JB this coming Aug 2008. See you players tomorrow for training. Pls report to turf city ANZA Field by 830am sharp and report to Thiru and Coach Kelvin. You will be wearing the black jeresy for those that is still holding on to it you have to bring them. I would like to congratulate Coach Kelvin and Coach Nagami for successfully completing their Level 1 referee and coaching course conducted by our very own Singapore Rugby Union. It will be an added advantage to the club with both of them been accredited by our Rugby Union. Looking forward to new training and coaching ideas from them in the near future. Once again congratulation to both coaches. Tomorrow training we will go though some ELV with coach Kelvin he will be helping us with that. Gals please bring along your contact gear in case we are doing contact rugby. For both guys and gals bring along running shoes too. The SRU have confirmed on Friday 7th July that all rugby in Singapore will be played under the new ELVs from 1 July instead of Aug. So we need to get ourselves familiar with the new changes. It is imperative that all players make this session as we will go though the new ELV before we start our rugby season. Most of us may not know that the tri-nation have started yesterday. With New Zealand winning South Africa 19-8. Please see below of all showing times (Singapore). There are sme pubs that are showing, BQ Bar and Harry's. Will check with Bloodies if they are showing, if so we will all go there and watch. First and foremost I would like to congratulate the team (Nick, Dustin, Afiq, Syaffiq and Ailfan) that took part in the beach touch. Making it all the way to the semi finals, along the way winning most of their game and also thrashing a club. Club training tomorrow at West Coast Park. Time 4pm for the guys and 3pm for the ladies. Please don't be late. Mixed Touch Tournament tomorrow at Turf City is cancel as Blacks Stardust can't play us. So we will have to fix another date to play them. So PLEASE DO NOT GO DOWN TO TURF CITY TOMORROW. Those that I have selected for the National Touch Training, it will be on the 6th July at Turf City. Time: 9am to 1200noon. Please report to the field and look for Greg. Please your own training gear (boots, top and a change of clothes). See all of you at training tomorrow. As some of us may know, last night we had a seven's training for the boys that will be heading to JB in Aug.
Training was good and the attendance was great. There will be a training and selection for JB 7's team. Club Mixed touch rugby tournament. All players please report to Turf City at 1200noon Do not be late. Those already have the Jersey please bring along. 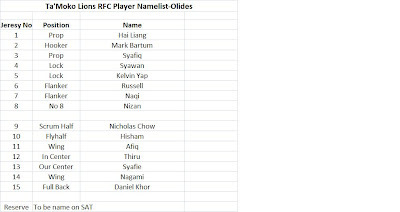 Players: Daniel Khor, Mark, Bryan, Thiru, Gerald, Jack, Huiqi, Suijing, Amirah, Rebakah, Mia, Thiru. All supporters are welcome. Club training this sat will be at West Coast Park: 3pm for the ladies and 4pm for the men. Coach Kelvin will be away this weekend for Rugby Referee course. 5 players from the club are taking part in Beach Touch, Nick, Dustin, Afiq, Syaffiq and Sham. We wish them all the best..............!!!! Youth in Touch Tournament. Date 12th July, Time: 9am onwards. I will have the name list up by this Friday. So keep a look out. JB 7's team selection and training. Please come down for selection. It will be a very good exposure for players to play overseas. Last night was the first training I had with the boys, however I would need more players of that age group to come for selection. Selection started last night. My final cut will be end of July. Training will be every Tue and Thur at CCAb and Sat at West Coast Park. I need to have feedback on last Sat trg with our sponsor Lets Get Physical. Pls leave the comment and feedback for me on this post. Like how you like the trg and do you think there should be more to be done and so on. Any comments will be good for the club and the sponsor. For those that are playing on Sat for teh touch tournament pls come down at 6pm for trg 1st before the actual trg start. Pls do not be late. We are still in the midst talking to ANZA in regards to the usage of the field at Turf City. Rest assure that we will get a pernament field for the club. The club kit will be in Singapore once our Sponsor Playmore International ship in the kits to us. As they will be shipping in by sea so it will take a little longer than Air. So players and supporters please be patient. You can take a bus 401 or 400 from bedok bus interchange. The club have come up with a club play book for players. The coaches are going through it now and once they have vexed through it we will place it in the blog for all to print out. Please keep a look out for the post. This Sat will be a day of fun, conditioning and training for all. Both young and young at heart(seniors). Our sponsor Lets Get Physcial and their trainer will give us some conditioning work, fun games and after that the coaches will take over for some drills. Attendance for all players will be greatly appreciated. Veune will be at open space near by Macs and there will be a restroom where players can shower after the training session. The club will be sending a mixed touch team to take part in the MId Year Touch Tournament at Turf City starting this Sat. All players please report to the field at 1200noon and don't be late. Jeresy will be provided on that day. The squad will be made up of 12 players whom we will select. The team will be leaving on 8th Aug 2008. During this point of time, we will try to arrange some games for the team once its formed. Ta'Moko Lions RFC Team Bonding Session! We need to know how many people will turn up on 29th june, sunday for the potluck! SO PLEASE REPLY THIS POST via email! Also, we need to know who's bringing what food to avoid having everyone bringing the same kind of food. EVERYONE MUST CONTRIBUTE ABIT OK! If almost everyone turns up for the picnic, each of us will then only have to bring a small amount of food(:so yes, please come come and help lighten each other's load. plus it's our very first TA'MOKO TEAM BONDING!!!! WOOOOOO!! Other items that you can bring: - drinks! bottled drinks/ packet drinks/ alcoholic drinks? lol. - UTENSILS! eg. plastic plates, cups, forks, spoons. As i've mentioned earlier, if majority of us are going, each of us will then only have to bring a small amount of food (10 pax). OR, you guys can also go into small groups, decide on something to cook and then bring it to Botanical Gardens. For eg, person A, person B, person C going to person A's house to cook fried rice. yay. Please decide and reply ASAP BY THURSDAY! All players are to bring a food item and drinks too. There will be games going on. The club will be sending a boys team and a girls team for the above mentioned event (Under 20s). So please show your interest in representing the club by droping your full name, DOB, NRIC and telephone down in the comments by Weds as I need to submit the forms to touch singapore. I already have some names in the last post. As most of us are aware that we as coaches have gone though some of the training with you guys, defense, attack, lineout and scrum. So see you guys tmw for training. So lets get dirty tmw for training. Lets Get Physical our sponsor is running trial program tomorrow at East Coast Park, the open space after the indoor football court. I would like to ask players that are now on hoilday to attend this trials. There are some ELV changes. 3) there is no need to have an equal number of players in the lineout as the throwing team, ie we can have more. 4) ball passed from outside 22 to inside 22 and kicked straight out will result in no ground gained. The club is planning to send in two teams for the above tournament. One boys and one girls team. Both will be playing in the under 20's age group. Please drop your name in the comment area. A job well done. It was a hot and sunny day at NTU but all three teams player turn up for a great game of touch. New rules of playing touch as it was 4 on 4. Anyway the teams did well. Tamoko Lions 1 went all the way to the semi finals. As for the oldies we will try again. Thank you supporters for comng all the way down to NTU. We would like to send a team for the above mentioned tournament that will be held in Singapore on 29th Aug to 30th Aug. Please leave a comment if you wanna represent the club for this event, we will, from here do a selection of players for the tournament. Please be inform that as of this week training will be held three times week until further notice. Club Secretary please be present for the meeting. Ms. Chew Wan Ping and Ms. Amirah. Club training: As the season is approaching(NRC League), we will be training from this week onwards three times a week. Tue, Thur at CCAB 7-9pm and Sat West Coast Park 4-6pm. All players please take note. Club Subs: For those who have not paid up the dateline is by the end of this week. Those that are facing monetary problems please approach the coaches or the club treasurers for help. You could even pay on a weekly basis if you are facing problems. Once players paid up their subs they will be entitled to the club kits and also to play in the NRC league. Outgoing Vice Captain: Syzawan your current vice captain will be off for enlistment this coming Friday. As such all his duties will be taken over by DUSTIN JAMES. So all players please give Dustin your fullest support. Women Section: As most of you know that we do have a women section. As such we want to recruit more ladies player both touch and contact. We do hope that the women section will be able to take part in the 15's and 7's tournament (Contact) and also in the Singapore Touch League(Touch). So guys please spread the word to your workmate, friends, girlfriends, wives, schoolmates etc. Club Constitution: The club constitution have been in placed and we will have it posted on the club blog. Please read through it once it have been posted. Any player that require a copy of it please approach the club secretaries. Ms. Amriah or Ms. Chew Wan Ping. Register of Society: As a club we need to register ourselves with the Register of Society (Singapore) so that everything is in place and in order. FYI. It was a good outing for all players old and young. As I have mentioned the result does not matter in the end. Its our well we played as a team and how good each player are in the team. Great Job guys. It was a fun game and also a hard game for all players. The most important thing is that we played as a team to see Syawan off for his Nationla Service. All the best to him and great to have you as part of team and also the vice capt for the team. WE do hope that you will be able to join us again after you have completed your BMT. I am posting details of Liang's chalet on behalf of him. Please take note of the date and spread the word around as many others are not aware of this. Food and beverages will be provided by Liang himself. Number of beds are limited and those who are coming would be strongly advised to bring an extra set of attire as his chalet is situated right beside the pool. Go figure. P.S. If you're keen on coming, kindly give Liang a text or call at 92323620. P.P.S. I have uploaded photos of Sat's match. Leave a comment with your email address if you want me to mail them to you. Our sponsor "Lets Get Physical" require around 6 to 8 players to help out for a trial fitness programs. So players lets do our part and support out sponsor. Pls leave comment if you are going. Name and Contact number pls. Please be advise that the game for this SAT 7th JUN is confirm. We have booked the field from 12-2pm. Only the young team will be wearing the black FBT jeresy. The rest will be playing for the young team. The oldies will be wearing your own set of jeresy does not matter the colour. And the namelist is as attached. It will be a 4 15mins quaters. We are trying to book a field this Sat for the internal game. However, if we cant we will play at west coach park. Just need to go down eariler to book the field. The team namelist will be place up by Thurs. Gals if you are keen in playing you are more than welcome. IT will be either 10's or 15's depend on the number of player turn up for training that day. The club kit will be arriving to Singapore by next Thurs. I have delay the shipment as the playing jeresy was not ready and I don't want to play for two shipping cost. So please PAY UP your SUBS before we will issue out the kit to all players. Please be reminded that tmw training will be at CCAB. And please be reminded to bring along you subs down. I will collect the subs tmw. So far there is three teams taking part in the above mentioned event. Whoever is keen in playing please call me or contact Thiru. Its mixed team only. So you will need 3 guys and gals to form a team. The namelist will be posted out tonight once Thiru gets it done. So keep a look out for the space. Training today was good even tho it was raining. Attendance was great. Would like to extend our warmest welcome to all the new boys to the club. Welcome you all. Kai Ora!!!!!!!!!!!!!!!!!!!!!!! I would like to hold an internal game among all players including senior players too. Please let me know if you are keen in playing. If we have enough player it will be 15 a side if not 10's will be fine. We will book a field where could game and after take we could have team gathering. This game is mainly for Syawan as he will be enlisting to NS this coming Jun. We will be planning a team building session for all players both guys and gals. Please keep a look out for the upcoming event for the team building session. Please be inform that Sat game with SRC have been cancel. We will arrange for another game with other clubs and schools in due time. This is the reminder for those that have not paid up their annual subs. Its important that all players in the club paid up their subs in time. For those that have not paid up please do so by TUES and SAT. Club kit will be ONLY ISSUED to player that have paid up their subs. Please visit the link training resources. It will bring you to a blog that will assist players and to understand the game better. Sat club training as usual at West Coast Park where we are have been training for teh past two weeks. Please bring along water and your annual subs. BTW, the gals are playing at CCAB for the 2nd Round M1 Touch Tournament. First game at 0924hrs. If anyone is keen to come down and support then it will be great. As you may know Nicholas Chow was admitted to hospital for dengue fever on Mon. With the grace of God he has been discharge today and now back at home resting. Adidias is having a expo sale this week from 23rd to 25th May at Singapore Expo Hall 6B from 11am to 7pm daily. Up to 70% off retail price. Great turn out again for training. And couple of new boys into the team. Gals had their share of contact rugby last night. With 7 gals learning contact rugby. Great job and hope you gals like it. Bring running shoes, boots and WATER....Subs to be paid by today and this week. Pls bring along your boots as I would like to introduce some contact drills tonight. Please visit the merchandise page, we have wonderful offer for on field playing jeresy. All fund will be use to help in the running of the club on a day to day operations. So support your favorite rugby club Ta'Moko Lions RFC by wearing one of the merchadise offered in the store. Please be reminded that we will be collecting the Annual Subs on Tue and Sat. So make sure you bring along your subs. Thank you for your co-operations. Its was a hot Sat morning at West Coast Park. However, no matter how hot it was, the boys came for a great training sessions with the coaches. Awesome turn out for training with 28 players and 5 new Ngee Ann freshies that join the club. Great work Russell. Worth the while going down. Rugby shorts going at $9.50 per pcs however the sizes are 28, 30 and other bigger sizes. T-shirt at $9.50, Polo at $19.50, $29.50 and $39.50. So visit the store. The sales will be on the newspaper tmw, so I suggest to head down before the general public is aware. And also bring along your subs of $20 each player(guys and Gals). This wil be an annual subs for all players. Thank you. We will be collecting it this weekend. The Blacks Midnight 7s 2008 is coming back! And this year, there is rugby fun for everyone! Some of us have taken part in the above tournament in 2006 under NK. And we did very well, going all the way to the Plate Final losing out to the fast and hard hitter Guam players. I would like to send 1/2 mixed team for NTU Touch attack. Pls let me know who will be keen playing. The club kits.......It will arrive to Singapore on the 25th May. So keep a look out for it. Club playing jeresy can be purchase which your own customise name and numbers on it. The funds collected will go into the club funds to run the club. So guys and gals, support your Ta'moko Lions RFC by owning a personal jeresy. Please be inform that fitness training is this coming Tue. Bring along your shoes(track work) and boots(drills on the field). And also BRING ALONG WATER!!!!! Great Turnout again at West Coast Park today. With 20 boys new and old faces. Great training to by Coach Kelvin and Coach Bart. Next game will be SRC at Padang 5pm kick off, more information will be out in due time. Address: The Basement, The Wharney Hotel, Wanchai,Hong Kong.